1. Preheat the oven to 200°C, gas mark 6. Put the salmon in a shallow pan with the milk and the bay leaves, bring to the boil, cover and then simmer very gently for 20 minutes, until just cooked through. Remove the fish, take off the skin and flake the flesh. Reserve the cooking liquid, discarding the bay leaves. Meanwhile, steam the broccoli or cook in boiling water for 3-4 minutes until just tender,then drain thoroughly. 2. Melt the butter in a non-stick pan, add the flour and cook for a minute. Take the pan off the heat and stir in the milk a little at a time, keeping the mixture smooth. Bring back to the boil, stirring, and simmer for 3-4 minutes to give a sauce the thickness of thin cream. Season to taste and add the nutmeg. Reserve a quarter of the sauce then fold the flaked salmon and broccoli into the remainder. 3. Spread a little of the pesto over the base of a 1.8 litre greased ovenproof baking dish and cover with a layer of lasagne. Spread the pasta with pesto, then add the salmon mix and a scattering of grated cheese. 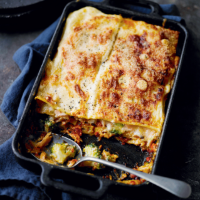 Keep layering the ingredients, finishing with a sheet of lasagne. Top with the reserved sauce and scatter with Parmigiano. 4. Bake in the oven for 40-45 minutes until the pasta is tender and the top is golden. Serve with a rocket and vine tomato salad.